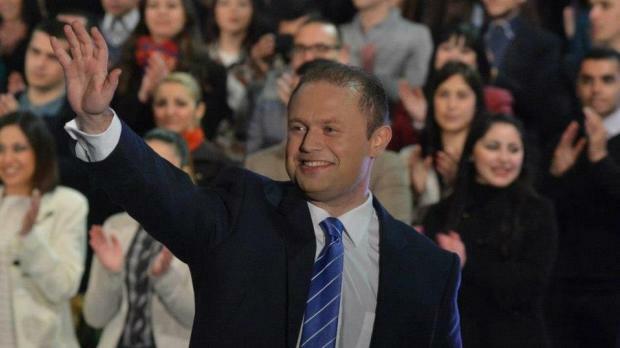 The Labour Party's electoral victory means that Joseph Muscat, 39 becomes Malta's second youngest ever prime minister, and the youngest since Dom Mintoff was first elected in 1955. The youngest ever prime minister was Sir Ugo Mifsud, co-leader of the Nationalist Party, who was 35 when he first became prime minister in 1924. This was the first time that Joseph Muscat was a general election candidate, but in 2004 he became the first Labour candidate to be elected to the European Parliament, and he served there until 2008, when he was elected to succeed Alfred Sant at the helm of the Labour Party. Married to Michelle and with two young twin daughters, Dr Muscat was educated at St Aloysius College and was a a Super One journalist and a financial adviser before taking his seat in the European Parliament. As PL leader, he moved the party to the centre, opening it up to sectors which previously tended to support the Nationalist Party. His extensive reform even included changing the party's formal name and emblem. Born in Valletta in 1861, Sir Gerald was the leader of the Constitutional Party. In 1917, after holding the post of Governor of Western Australia and New South Wales, he returned to Malta and set up the Anglo-Maltese Party and later joined the Maltese Constitutional Party. He was opposition leader in three legislatures between 1921 - 1927 and served as prime minister between August 1927 and June 1930. He survived an assassination attempt and died on August 22, 1940 at Villa Bologna. Born in Vittoriosa in June 1890, he served with the Royal Army Medical Corps in World War I. His political career started in 1923 when he joined the Malta Labour Party and later became its leader in 1928. He became the first Labour prime minister when the party came to power between 1947 - 1950. A party split saw him removed from the post as leader in 1949 and in 1950 he set up the Malta Workers' Party which subsequently governed in coalition with the Nationalist Party. He retired from politics in 1955 and died on July 6, 1962. Born in Cospicua in August 1916, he was prime minister during four legislatures. He became general secretary of the Malta Labour Party in 1939 and later became deputy leader and its leader in 1949. In 1955, the MLP was voted to power and he governed until 1958. He was prime minister during another three legislatures: 1971-1976, 1976-1981 and 1981-1984, after which he resigned both as prime minister and party leader. He stayed on as MP until 1998 and passed away last year. Born in February 1934, Dr Fenech Adami started his political career in 1961 when he became a member of the PN's executive committee. In 1975, he was assistant general secretary and in the same year he was elected chairman of the general council and administrative council. He had an important say in the party's reorganisation during the 1970s. He contested the general elections of 1962 and 1966. In 1969, he was co-opted after the death of Nationalist MP Gorg Caruana. In 1977 he was elected party leader after Dr Borg Olivier retired. In the 1987 election, the PN won the absolute majority and he led the country during that legislature until 1992 and again between 1992 - 1996. He served as prime minister again in the 1998-2003 legislature. When the party was re-elected in 2003, he signed the Accession Treaty taking Malta into the European Union and resigned a year later. He later served as President. Born in 1948, Dr Sant started his career as the chairman of the MLP information department in 1982, taking over as party president from 1984 - 1988. He contested the general election of 1987 and was co-opted following the death of Joseph Sciberras. He successfully contested the 1992 election and took over as leader of the party following the resignation of Karmenu Mifsud Bonnici. He won the 1996 election and served as prime minister for two years, until he was forced by former prime minister Dom Mintoff to call early election. He lost the elections of 1998, 2003 and 2008, when he resigned. He did not contest this general election but intends to be a candidate for the European Parliament election next year. Lawrence Gonzi entered Parliament as Speaker in 1992 and was first elected in 1996, serving as shadow minister for social policy and general secretary of the PN. After 1998 he became deputy prime minister and minister for social policy. He won the election to succeed Eddie Fenech Adami in 2004 and was prime minister when Malta joined the EU. He subsequently led the PN to a narrow victory in the 2008 general election.